I ran a session of Dragon Age last night, the fourth in a series. We had a ‘filler episode’ last week (as my players termed it) due to only half attendance, so this fourth session took up the main story again, after a diversion in the Fade. To be clear, the ‘filler’ was always planned as a fallback. I don’t tread water if I can help it. In this instance, I had something specific in mind and we played it out in a single (incomplete) session. The characters have chanced across a situation where a new Bann has provided protection for the populace, while the old Bann hopes to recover his role through acts of half-hearted bravery on the periphary. It has more than a passing resemblance to the basic set-up of the adventure from the Dragon Age Gamemaster’s Kit, including the general location and environment. But, I have inserted my own elements, obstacles, plot and villain. While I have players who have played Dragon Age games, I’m not overly bothered with accuracy or adherence to canon. I have set my game in an alternate Thedas, where many facets remain the same, but I have no wish to keep to the letter of someone else’s law. Where would be the fun in that for me, feeling that I needed to pass an exam or something just to run the game right. I have taken the time to read the game itself, but not much else. I simply haven’t had the free time to get far in the console game. 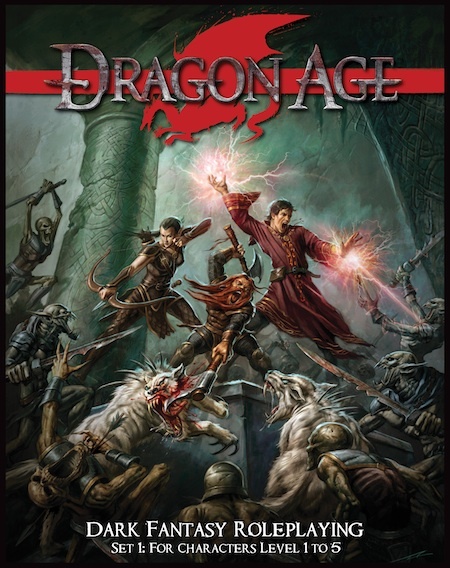 I have read a couple of novels based on the setting and I can heartily recommend the encyclopaedic Dragon Age: The World of Thedas – an enjoyable world guide packed with inspiring illustrations and a handy timeline. I have an interesting group adventuring through my version of the Dragon Age world. We have a Circle Mage, a would-be Templar, an aspiring Crow assassin, a charming Avvar barbarian, a Surface Dwarf with a dog, and a capable Feralden warrior with a missing nephew. It’s a good group, still in the lower levels – around Level 2 to 3 – because we’re only a few adventures into the campaign and only one character has played consistently through them all. I also admit to being a little stingy in handing out experience, although I’m doing my best to change that.